U.S. President Donald Trump says a U.K. tabloid published "fake news" when it "left things out" and only reported his critical comments of the U.K. prime minister's handling of Brexit. 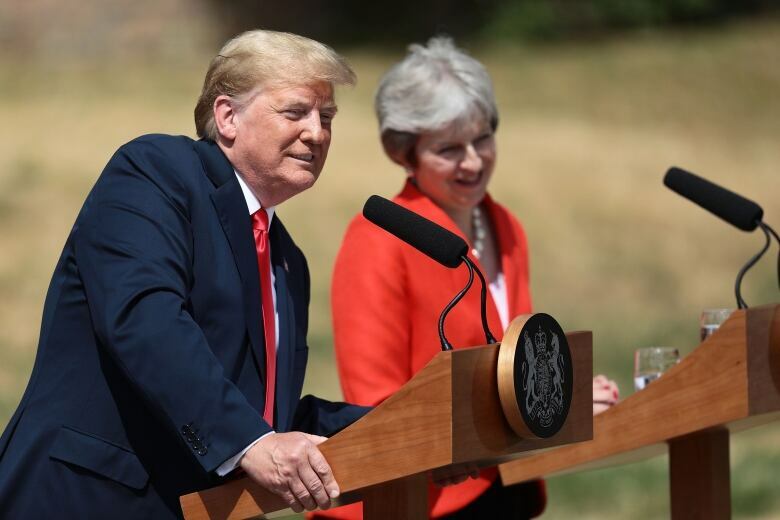 Trump responded to the Sun article, published on Thursday, as he and Theresa May held a joint news conference, following talks at her official country residence in Aylesbury, Buckinghamshire county, England, on Friday. The pair spoke to reporters a day after Trump arrived in the U.K. for a four-day visit, coming off a contentious NATO gathering in Brussels. Earlier, he spoke of having a "very, very strong" working relationship with May, and she said the U.S. is Britain's "longest-standing and deepest security and defence partner." She also credited Trump for pushing NATO partners to increase defence spending. Trump had told the Sun that May's Brexit blueprint would "probably kill" any bilateral trade deal with the U.S. At the news conference, he addressed the prime minister and said, "Whatever you do is OK with us … just make sure we can trade together." 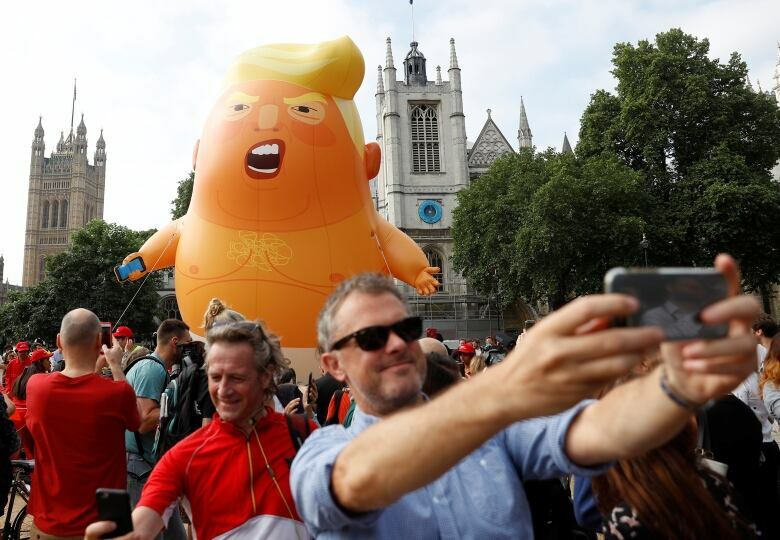 Trump also told the paper he felt "unwelcome" in London after learning of a huge protest that went ahead on Friday, featuring a giant balloon flying over Parliament, depicting him as an angry baby in a diaper. 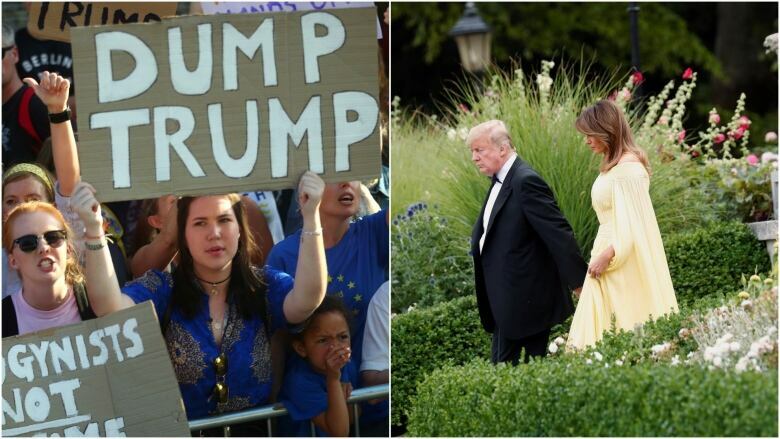 CBC's Margaret Evans takes a look back at some of Trump's more contentious statements on the U.K.
On Thursday night, hundreds of demonstrators chanted outside the U.S. ambassador's residence where Trump was staying on the outskirts of London. On Friday, tens of thousands of protesters marched through London against Trump. 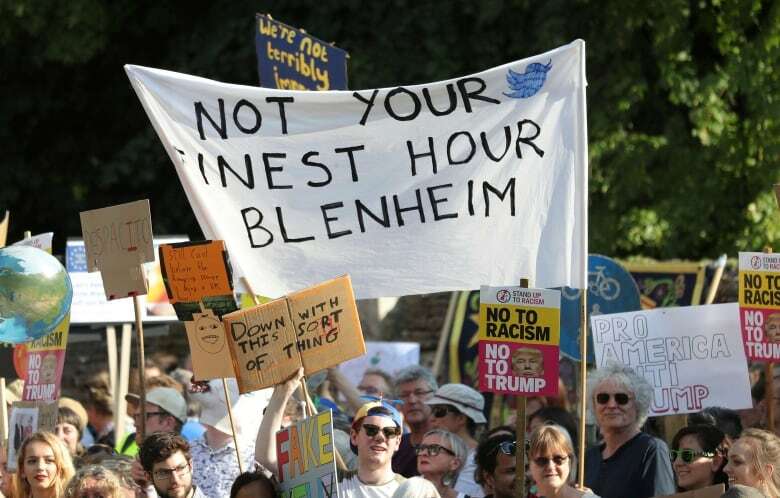 Trump blamed the hostility in part on Mayor Sadiq Khan, who gave protesters permission to fly the six-metre-tall balloon depicting Trump as an angry baby. Trump also blamed recent terrorist attacks in the city on Khan, who is a Muslim. The president claimed Europe is "losing its culture" because of immigration from the Middle East and Africa. During Friday's news conference, the two leaders expressed differing views on the benefits of immigration to Europe. Trump said immigration has been "very bad" for Europe and reiterated that it's is changing the culture of the continent. May said "immigration has, overall, been good" for the U.K., contributing to its society and economy, but added that border controls were important. 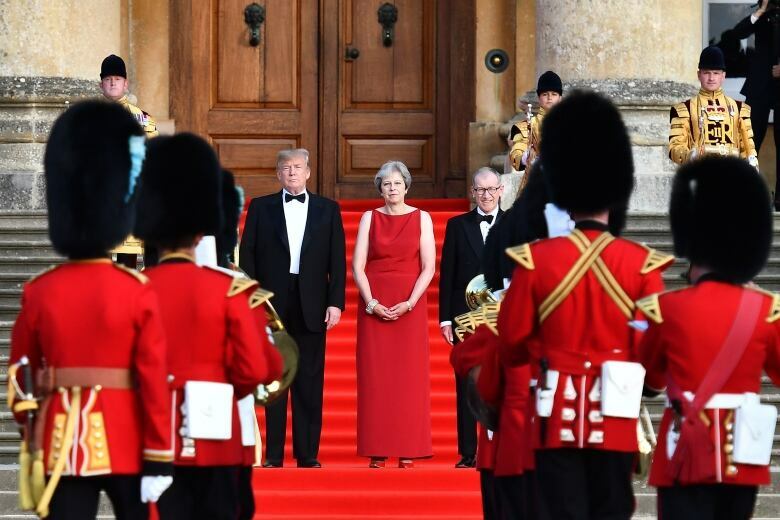 In contrast to the president's sharp words, Trump's first event in England was an oasis of warm greetings at an evening reception at Blenheim Palace, birthplace of Winston Churchill, the larger-than-life British leader cited by the president as a model of leadership. That was just one of several helicopter rides on the agenda for Trump, whose staff opted to keep him largely out of central London and the swarms of demonstrators. Trump's Marine One departure from the ambassador's residence was met by jeers from demonstrators banging pots and pans, and another pack of protesters lined roads near the palace. Some of their signs read "Dump Trump," `'Lock Him Up" and "There Will Be Hell Toupee." Police worked overtime, their days off cancelled. The outdoor arrival ceremony at Blenheim — Trump wore a tuxedo and Melania Trump a butter-yellow, chiffon, off-the-shoulder gown — was a grand affair marked by a military band in bearskin hats, hundreds of business leaders in black tie and gorgeous setting sunlight. During his 28 hours there, Trump had disparaged longtime NATO allies, cast doubt on his commitment to the mutual-defence organization and sent the 29-member pact into a frenzied emergency session. Trump claimed member nations had agreed to boost their defence budgets significantly and reaffirmed — after days of griping that the U.S. was being taken advantage of by its allies — that the U.S. remains faithful to the accord. Neither Trump nor NATO offered specifics on what Trump said he had achieved. French President Emmanuel Macron quickly disputed Trump's claim that NATO allies had agreed to boost defence spending beyond their existing goal of two per cent of gross domestic product by 2024. "There is a communique that was published yesterday; it's very detailed," Macron said. "It confirms the goal of two percent by 2024. That's all."